Fabulous toy lets girls build their own movie machine and then use their invention to create their own movies. Brilliant! 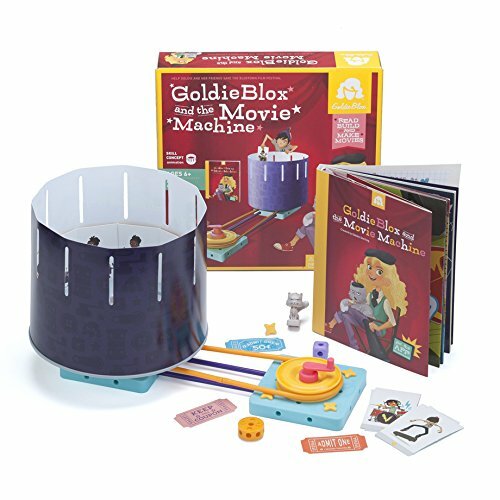 GoldieBlox and the Movie Machine is an engineering toy for girls that contains a construction kit to build a zoetrope (a pre-cinema animation machine) and a book. The toy comes with a companion app of the same name. Each is terrific as a standalone, but both play experiences are enhanced by combining the two. 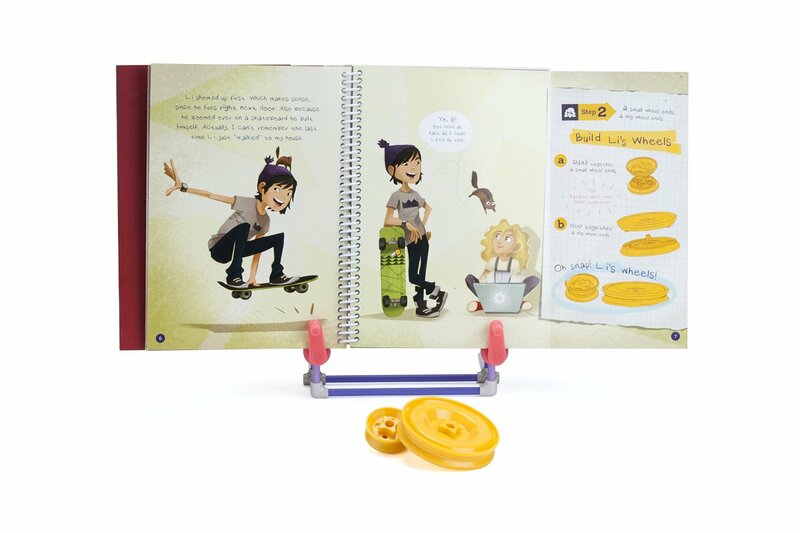 The magic of this toy is the hilarious storybook that comes with the kit, which motivates girls to get building and creating. 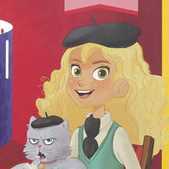 Goldie, a little girl who is never far from her tool belt, saves the town's movie festival by building a movie machine. Little girls reenact the story by building their own movie machine, and then learning how to use stickers and their own drawings to make movies. The building kit comes with a cat figurine (Benjamin Cranklin! ), the book, and the parts to build your own movie machine, including pegboards, axles, a belt, a crank, wheels, cards to place in the movie machine, and other doodads. The book, which is cleverly written and hilarious to read, also contains stickers, movie tickets, and ideas on how to draw on the cards to create a stop-motion animated movies. The companion, free GoldieBlox and the Movie Machine app extends the movie-making part of the toy into the digital world. The app has step-by-step tutorials showing kids how they can make their own stop-animation movies. In addition to templates, the app provides budding Kathryn Bigelows with digital stickers and other drawing materials to let their imaginations run wild. When kids complete an animated short, they can replay it in the app for friends and family. 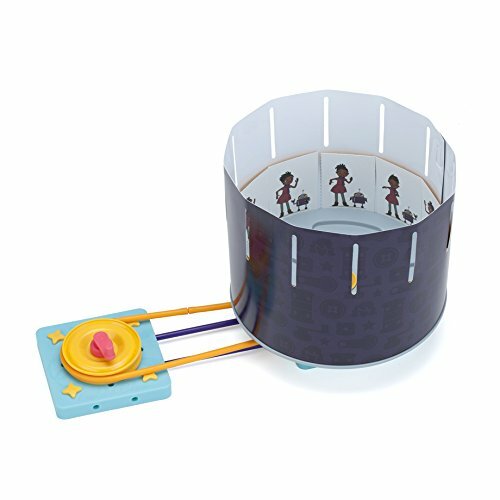 If they have an Air Printer, they can print their digital movie cards so that they can place them in the zoetrope that they built with the toy. It's cool to be able to bring the digital back out to the real. 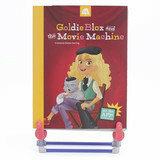 GoldieBlox and the Movie Machine is brilliant in the way it provides girls with a reason to build and become engineers. By combining a building kit with a story, girls are motivated to explore the building kids so that they can be just like Goldie. The toy also taps into little girls' creative sides, as they plan and create their own movies to show in their self-made movie machines. And the connection to an app is icing on this already delicious cake!